Hailing from India, plantain chips is not new to me, but I was unaware that we could make it fat free by baking plantain chips! Boy oh boy! Was I in for a huge surprise after trying the baked plantain chips recipe from my friend’s blog a couple of years ago! Unfortunately she doesn’t blog anymore and the blog is no longer online. I picked up quite a few healthy recipes and fitness tips from her blog. Before I knew this recipe I used to wonder what to do with plantains when I saw it in the grocery stores. My husband being a healthy conscious person I knew he wouldn’t eat plantain chips if I made it in the traditional way of deep frying it in oil. So I never bought it. Fortunately one of those lousy afternoons when I was bored and didn’t have nothing much to do landed upon the baked plantain chips recipe. Seeing the picture in that blog I couldn’t believe my eyes! The chips looked thin, crispy and very delectable. I couldn’t wait to try the plantain chips recipe. I bought plantains in our next grocery trip and got straight into the baked plantain chips making process. Did a couple of batches to master the right size to be sliced for each chip. It should be neither thick nor too thin. If it’s thick it will take lot more time and may not get crispy evenly either. 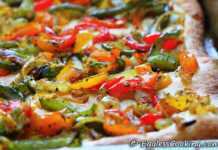 On the other hand if the slice is too thin, you may end up burning it if you are not alert. Once you master that then there is no going back to deep fried plantain chips. You would prefer baking plantain chips over the former. Not only that you will also start experimenting the same procedure with other firm vegetables too. I know because I did! I have tried it with raw banana, potato, bottle gourd. I have always wanted to try it with beets and carrots. Maybe one of these days I will. If you are looking for a similar healthy snack recipe you should try the oven roasted chickpeas recipe. Easy to make, big on taste and healthy too. 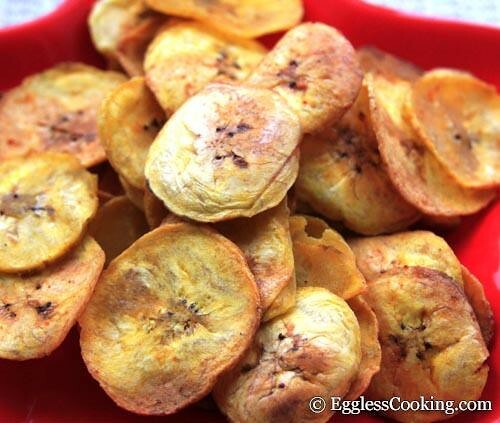 If you are wondering how to make plantain chips the healthy way, this baked plantain chips recipe is the answer. Healthy doesn’t have to mean “not tasty” anymore! Pre heat the oven at 425F/220C for 15 minutes. 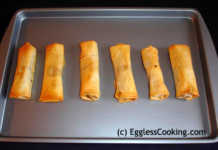 Line a big cookie sheet with aluminum foil or parchment paper. Meanwhile in a large bowl whisk together the oil, salt and seasonings. Stir in the sliced plantain and coat it well with the spice rub. Spread the sliced pieces onto the baking sheet and bake for about 20-25 minutes, flipping it once in the middle. The taste and texture of these baked plantain chips is exactly same as that of those fried in oil. Using coconut oil makes it even better. The first time I made these, I cut the slices thicker, so it took around 30 minutes and it baked evenly. But this time I made it very thin, so it was getting burnt very soon. I think I should have reduced the oven temperature. Next RecipeThe BEST Homemade Soft Pretzel Ever! Oh! neat idea! Thanks for sharing. Looks very good. I’m making them right now. Hi Shirley, it depends on how thick or thin the plantain slices are. If its too thin and you bake it at 425F it will definitely burn if you don’t keep an eye on it. For 425F it has to be slightly on the thicker side or at least you should keep shaking the pan/checking it quite often. That should be it Sonya. The thickness of the slices has to be considered while setting the baking time. so were they yellow or green bananas? sooo excited!!!!!!!!! The unripe green plantains you can find in Mexican/Indian grocery stores. Hi there! These look super tasty, what temperature did you cook these at? Thanks! It�s 425F. Please check the link in “J and B�s plantain chips” for further details. Since the recipe is from another blog I did not reproduce it. I guess you have a mandoline slicer. Do u have any recommendation on the brand to buy. I see many brands and makes and not sure which one to buy. Thanks Madhu. Sai, it’s not a mandoline from here. It’s the regular slicer from India. It also doesn’t have various thickness etc. Simply one blade. My mother in law gave it to me. She got it from some marketers who sell stuff door to door. i tried this recipe. the only thing was i did not slice them well. first i sliced with veggie slicer. they were very thin and then with knife and they were thick. so they did not get baked evenly. how do u slice them? also should we line them each separately in the oven? also i tried a vegan pineapple cake with silken tofu this sat for a party and it turned out great. will share pics soon. it was a hit with the kids. i am planning to do that as a layer cake for my son’s 2nd bday this sunday. wish me luck. so if i have to bake in a 9 x 13 rectangular pan as a layer cake how much of the flour do i need? thanks so much for the silken tofu recipes. thats what helped me a lot. Sai, I have sliced using a vegetable slicer as well as with a knife. The ones with the knife doesn’t come even, so it’s half baked. The other one slices pretty thin and you have to watch constantly so that it does not burn, but it bakes evenly and is crisp. Sure share your recipe and pictures Sai. Reg. cake pan size, I found this. Check the answer to the first question (finding the pan size using mathematical calculation) after the intro and charts. It clearly explains how to increase a recipe according to the pan size. thank you! they turned out crispy and delicious! what is the baking temperature? It’s 425F. Please check the link in J and B’s plantain chips for further details. Since the recipe is from another blog I did not reproduce it. baked chips looks very delicious & healthy too. Nice alternative to frying it twice. I like tostones but it gets way too greasy sometimes. These look delicious. I might have missed seeing this at Jugalbandi but I’m glad I found them here. I tried their lotus root chips … lovely… they look wonderful Madhu !! I plan to try with sweet potatoes too ! 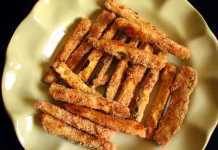 Healthy snack Madhu.I have only fried them..Will try this baked version..
Looks simple and tasty. Guess we can make similar chips with potatoes as well. i personally do not like the plaintain chips..only jackfruit and tatoes of course!! but jeeves loves these..gotta make-em and check out the julagbandi site too for the lotus ones! the mandolin really makes them thinner and crisper. i just cut them by hand ‘cos i’m too lazy to pull out the mandolin. have you tried these chips with lotus root? they are even better. we have a recipe. Chips have come out lovely. Indeed a guilt-free snack. It looks the ripe plantain chips.